Note: BEA uses the value-added approach to estimate industrial contribution to GDP by state, or gross state product, presenting industrial value-added output by state based on the North American Industry Classifications System (NAICS). Mining comprises establishments that extract naturally occurring mineral solids, such as coal and ores, crude petroleum, and natural gas. The data are converted to real (2009$) GDP by state by applying national chain-weighted price deflators. North Dakota. 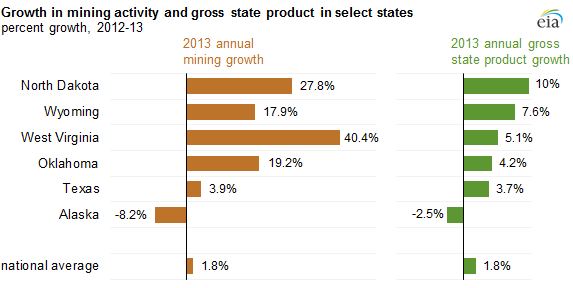 In percentage terms, North Dakota has experienced more change in its economic makeup from mining activity than any other state, going from 2% of its economy in 2003 to 14% in 2013. North Dakota's crude oil production surpassed 1 million barrels per day in average monthly oil production earlier this year, because of production in the Bakken region. Associated effects from Bakken development, such as growth in construction, real estate rental and leasing, and accommodation and food services, also increased economic output. Growth in the mining sector has helped North Dakota achieve the lowest unemployment rate in the nation at 2.7% as of June.